On Wednesday, the defending Super Bowl champions hosted five-time Pro Bowler and Super Bowl 50 champion Demaryius Thomas. Thomas, who was released from the Texans this past February after being acquired from Denver before the trade deadline, is coming off of a ruptured Achilles that he suffered in Week 16 in a loss to the Eagles. Last season, he caught a grand total of 59 balls for over 670 yards and five touchdowns. Thomas was drafted in 2010 by none other than Patriots Offensive Coordinator Josh McDaniels, who was Head Coach of the Broncos at that time. While in Denver, Thomas broke 16 franchise receiving records, was elected to five Pro Bowls, and was a huge contributor in the Broncos playoff run that ended in an eventual drubbing of the Carolina Panthers in Super Bowl 50. In his career, he has totaled 672 catches for 9,154 yards and 62 touchdowns. At the age of 31, it is still clear that Thomas can contribute to an offense, and after playing with future Hall of Famer Peyton Manning for years, a chance to play with the legendary Tom Brady must be a dream come true. However, a torn Achilles is a brutal injury to recover from, especially at the wide receiver position. If the Patriots do sign Thomas, then it will be interesting to see if he can contribute in the same way he has done in the past. 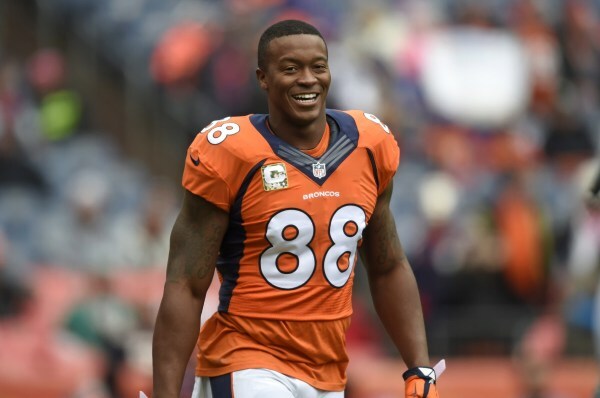 The Patriots are thin at wide receiver, and signing Demaryius Thomas to a one year deal could offer them a nice low risk, high reward situation.